Nearing Retirement: Are You Financially Prepared? Blog Nearing Retirement: Are you Prepared? Nearing Retirement: Are you Prepared? A client and his wife – both in their 60’s – recently came in to my office. They are nearing retirement and were preparing for this event by reviewing their financial reserves. Knowing they had just three to five years before retirement, they were uneasy about the total they’d accumulated. They couldn’t get one thing off their mind. Will we have enough? Will we run out of money during retirement? Their story is similar to many ‘nearing retirement’ clients I’ve helped in the past few years. In 2006, this couple had over $500,000 in 401K programs and felt fairly confident in their financial future. But by the end of 2008, their funds had plummeted to less than $300,000. Ouch! They wanted to make sure that type of loss never happened again. This response made me angry. This typical Wall Street answer of ‘stay the course’ is not relevant or helpful for soon-to-retire or retired individuals. How do I know? Well, this exact scenario happened to me. When my portfolio – which took me 15 years to accumulate – dropped by 42% in 2008, my financial advisor gave me the same answer: “a market event, beyond your control”. I knew there had to be a better way. So, I set out to find one. My search for secure financial options for my own retirement sent me on a five year journey. Today I am happy to be helping individuals, couples and families prepare to have a stable, enjoyable retirement. What I’ve found is that the majority of soon-to-be retired individuals in our community are not prepared for their nearing retirement. And, even fewer will have their retirement funds in the proper plans to give them the safety, security and prosperity they desire for their retired years. My search results were not atypical. According to the Center for Retirement Research at Boston College, “Less than 10% of baby boomer retirees will be lucky enough, and smart enough, to plan and…. prosper in retirement.” The researchers went on to say three things are needed to ensure your retirement is financially stable. 3. You must act now. Back to the couple I spoke of in the beginning of this article. My soon-to-be-retired clients were sitting with the entirety of their retirement funds in the stock market. While the stock market can present a great opportunity to build on your principal, the market is high-risk for anyone at or near retirement age. This situation did not offer the safety and security my clients wanted for their nest egg. So, I asked them the five crucial questions to prepare you for retirement. 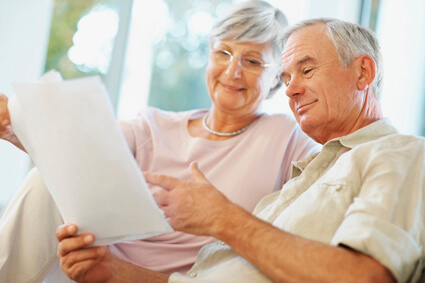 If you are in or nearing retirement, you should be asking yourself the following questions. 1. What does your retirement plan look like? If you response was similar to “What is a retirement plan?” you are not unlike my nearing retirement clients. Often, couples assume they should stash away money and at retirement this miracle occurs where all your needs are taken care. This is not realistic. Planning for retirement, is not only about putting away money. 2. How much income will you need during retirement? This number she be based off more than just your day-to-day needs. How about fun things like dinners out, visiting the grandchildren, going on that dream cruise you’ve had on your list for years? 3. How long will your income last during retirement? It’s great to know how much money you have put away, but if you have no idea how much you’ll be spending, that large looking nest egg might not last as long as you’d like. 4. Can your income go down during retirement? Retirement is not a good time to run out of money or have a reduction in monthly income. If like many couples, if you’re nearing retirement and have a suspicion that you may run short on funds, we need to get planning. 5. Are you protected if you have a health event? Are you prepared for a long term care situation, or even standard health care deductibles? A recent study by the Employee Beneﬁt Research Institute estimated that a 65-year-old couple that retired in 2012 will need from $227,000 to $240,000 to pay for out-of-pocket medical costs throughout retirement. That’s just the expected out-of-pocket cost after Medicare. What types of health benefits have you procured? If the previous questions gave you cause for concern, you’ll be happy to know about the plans I’ve found on my quest for secure retirement. I’ll list them plainly. There are insurance products that can guarantee you will not lose your principal investment. These annuity products guarantee competitive growth for retirement income streams that will never stop until you both die. These income streams will never go down and income continues even if the account value goes down to zero in case of longevity. Guaranteed retirement money is available to you every month in your mailbox – in addition to your social security checks. There are places to put some of your money where you cannot lose your principal and get guaranteed lifetime retirement income that will never go down. My goal is to offer safe retirement income solutions. This is what I know and this is exactly what I do for my clients. I have found great satisfaction in showing people in their late fifties through sixties how to create an income stream from their money that they’ll never outlive. Isn’t this what we all want for retirement? Now for that couple nearing retirement that I told you about? I helped them develop a comprehensive plan based on their risk tolerance. They acted and moved a large portion of their money to the safety of a fixed indexed annuity – a plan that offers security and prosperity for the future. And for you, what now? Stop worrying about your nest egg, it’s time to act. A fixed indexed annuity plan guarantees you can’t lose your principal and offers a revenue stream that will stand the test of time. If you are close to or nearing retirement, and can’t afford to lose 40% of your retirement income again, contact me for a no obligation and no pressure consultation. Let’s make sure you get what you want out of retirement.